Doctors are great. Doctors are great until they make you step on a scale and tell you how much weight you’ve gained since the previous year (even though you haven’t grown taller). I know I should be above this, but I can’t help but try to wear my lightest clothes for my annual weigh-in. 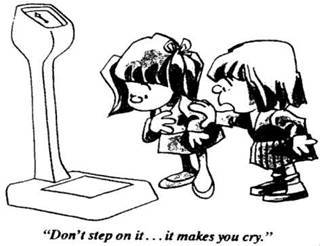 And why is it that they insist that you keep your shoes ON when you step on the scale? HELLO! Those are extra unnecessary pounds that will forever be written on my record. It’s funny, but I think many of us would be quicker to share our GPA, annual household income, or the number of white hairs we’ve found on our head, than to disclose our true weight. (insert collective *shudder*). Outwardly we’re really nonchalant about it. But when we go to friend’s homes and find a scale in their bathroom, do we not stare at it and secretly dare ourselves to find out what judgment day holds for us? Will it be a win for all woman-kind, or a meteoric loss? When we return to the dinner table, will we take on dessert as our just reward, or will we politely decline the soda/wine for the non-caloric water? …Or is that just me? Sisters, we’re all broken. Broken by wounds of the past, wounds of insecurity, and the lies that bombard us day and night. What would a godly sisterhood look like if we tried to mend each other’s wounds and promote a culture of safety and healing? Instead of bragging about how much we can eat and still fit into those tiny pants, what if we boasted about our insecurities and our effort to find worth in Christ? Instead of hiding our insecurities about our fluctuating body weight, what if tried to remain steadfast in the light of Christ and our sisterhood of believers? As God’s cherished daughters, let’s live as those who ARE cherished.